The Charleston Solar Co-op has selected DT Solar to install solar panels for the 25-member group. Co-op members selected DT Solar through a competitive bidding process over two other firms. The group will hold its final public information session on Tuesday, October 24 at 5:30 p.m. at the Charleston Area Alliance Building, 1116 Smith St, Charleston WV 25301, to educate the community about solar and the co-op process. Co-op members selected DT Solar because of its competitive pricing, quality equipment, excellent warranties, and union workforce. The co-op is open to new members until November 17. Charleston-area residents interested in joining the co-op can sign up at the co-op web page. Joining the co-op is not a commitment to purchase panels. DT Solar will provide each co-op member with an individualized proposal based on the group rate. 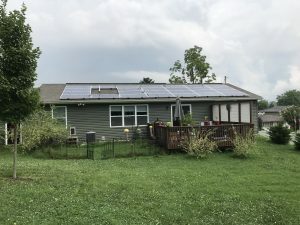 By going solar as a group and choosing a single installer, participants receive the same fair and competitive base pricing and have support from WV SUN throughout the entire process of going solar. Tuesday, October 24, 5:30 p.m.